Start your kids summer vacation off right by signing them up for free ATV training during ATV Safety Week! From June 1, 2019 until June 9, 2019, you and members of your family ages 6 and up can take the ATV Safety Institute’s ATV RiderCourse at participating training sites across the country for free! If you don’t have access to an age appropriate ATV, look for classes that have loaner vehicles available. 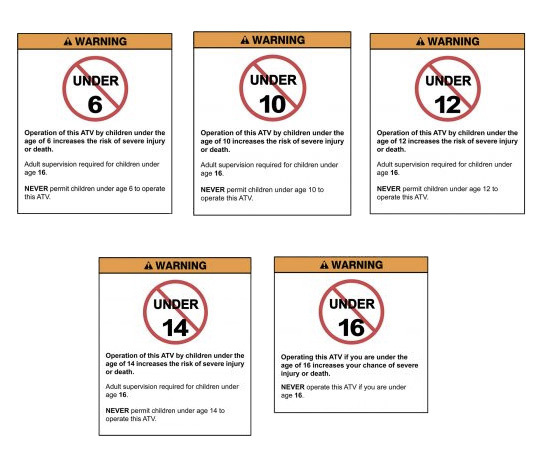 Check the warning label to find out what the minimum age of the rider is for that ATV. Not sure where to look? This label is affixed so it can easily be read by the rider when seated in the proper operating position. Find it. Know it. Enforce it. To sign up, just give our Enrollment Express Representatives a call at 800.887.2887.